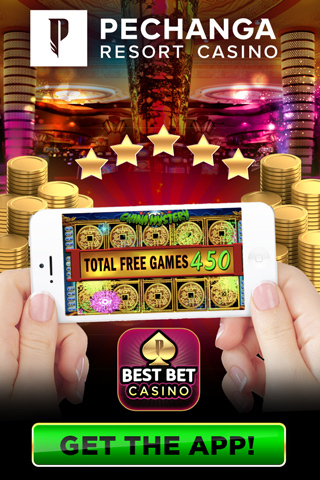 Social casino games are free-to-play games online, on your phone, tablet or on Facebook that have casino games like slots, video poker, keno, bingo and blackjack. You can play online on your computer or install the game on your mobile device and just start playing casino games! Many real, land-based casinos have social casinos so that their customers can play their favorite games at home. Pechanga has done just that, with Best Bet Casino. Best Bet Casino is Pechanga Resort Casino’s free-to-play social casino game. Choosing the right partner in this kind of endeavor is critical because you need someone who has access to real casino games in the digital world, who can build an amazing app and offer ongoing above-and-beyond support. Pechanga chose to partner with social casino app developer Ruby Seven Studios so that they could offer their casino patrons all of the games they know and love. One of the major aspects of a social casino, is that you get plenty of free coins so that you can keep playing your favorite casino games for free. At Best Bet Casino, you get daily coin bonuses, bi-hourly coin bonuses, level up coin bonuses and more, so that you can keep spinning and dealing! Social casino games also have, maybe obviously, casino games! However, there are differences between games. Best Bet is unique because it is jam-packed with the same real casino games that you see on the casino floor. Slots from Konami, Everi, and Aristocrat like China Shores, Mata Hari and Buffalo Moon, video poker from IGT like Multi-Strike Poker, and so much more. Most other social casino games give you their own version of famous games, with similar characters and themes, but Best Bet goes above and beyond to bring you the real thing. What is one of your favorite things about going to Pechanga or any other casino? Playing slots with your friends! Social Casinos like Best Bet Casino are no different. You can invite friends to play along with you, gift your friends coins, ask for gifts from your friends if you are running low, and have your own Pechanga/Best Bet community. Playing social casino games are fun, interactive and most importantly, FREE! Play Best Bet today to enjoy all of your favorite games at Pechanga right from home(or work 😉). Pechanga Bingo FREE With Best Bet Casino!